Human patient simulation is a teaching tool that is used in a variety of ways. Simulation challenges students to think critically when caring for a patient with a complex medical condition, and allows educators to provide immediate feedback on student performance. 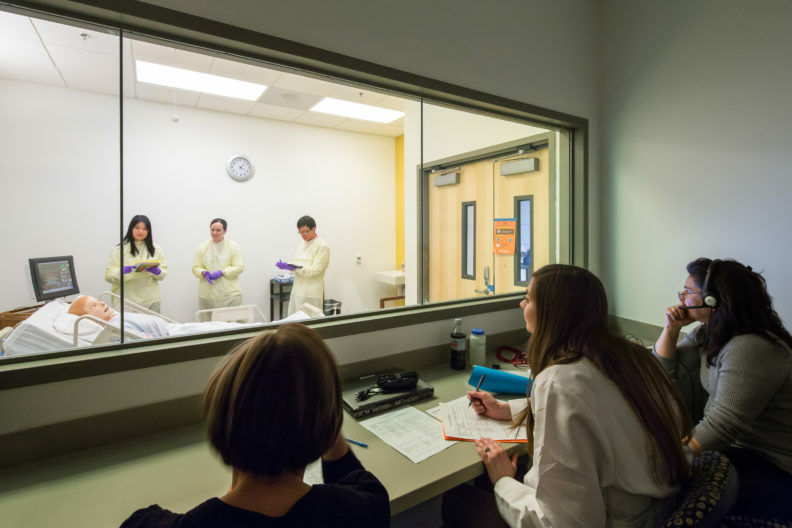 Human patient simulation allows continued practice in a controlled environment without adverse consequences, but gives students a variety of realistic experiences and exposure to high consequence, low occurrence events like medical emergencies. The high fidelity manikins can be programmed to display a variety of disease states and also can exhibit appropriate responses to medication therapy. Students not only learn and practice physical assessment skills, but also practice communicating with patients because the manikin can be programmed to respond to questions. The manikin we use is highly sophisticated with expanded fidelity: the eyes blink and the manikin can cry or sweat, and is operated wirelessly. The college also uses standardized patients as a simulation modality. A standardized patient is an actor who is trained to portray a real patient. Simulation with standardized patients allows students to learn and be assessed in a simulated clinical setting. Standardized patient simulation is particularly effective when students are practicing and demonstrating communication skills. Interprofessional collaboration gives students the chance to not only practice interacting with patients, but also valuable experience working in a professional team made up of several health care disciplines that is emerging in modern health practice environments. Immediately following simulations, the faculty facilitator conducts a debriefing. The facilitator addresses communication efficiency, professional attitude, clinical skills and knowledge, and error identification. Student pharmacists work in groups of 3-4 during these realistic, hospital-based scenarios to implement a therapeutic plan for the patient. Effective emergency preparedness and response planning equips emergency responders to be ready for any type of incident or catastrophe. Healthcare providers and emergency responders involved in acute care also require training and practice in recognizing and treating rare, but potentially devastating, exposures to toxic agents. SimMan has participated in many emergency preparedness exercises including: active shooter, cyanide toxicity, building collapse, and Medical Reserve Corps. training. We periodically participate in health sciences camps in the Spokane and surrounding areas, using human patient simulation with teenagers to introduce them to what a pharmacist does beyond counting pills. Campers get a hands-on opportunity to interact with the high-fidelity manikin and are taught how to use basic physical assessment skills. Human patient simulation has been at the WSU College of Pharmacy and Pharmaceutical Sciences since 2007. Simulation was first introduced to the college through nursing colleagues who had purchased manikins. Soon pharmacy faculty discovered the benefit of human patient simulation in pharmacy education and introduced it into the curriculum.